Since inception in the year 2015, Techsuppen Enterprises is reputed Manufacturer, Exporter, Trader and Service Provider of Electrical Control Panels, PLC Programming Service, etc. Being a quality-centric firm, we provide the best in-line products available in the market. The offered assortment is created using the quality tested raw material and usage of advanced technologies. These equipment are much-admired in the market due to exceptional performance, sturdy construction and long service life. We content our clients with our matchless efforts and diligence, who have in turn, laid their valuable trust and reliance upon our brand since our initiation. To render our services with brilliance and ease, we have hired a skilled team of competent executives who are amongst the greatest endowments present in the industry. 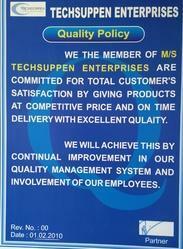 Our Manufacturing Brand Techsuppen. Meticulous quality testing is carried out to ensure the usage of the best range into production. Production commences in our organized and modernized facility. Spread over a vast area, it provides huge space for production, tasks of research, testing, cataloging, storage, and other processes and organizing. A pool of extremely competent team is well-versed with the operations of the facility. We are backed by ultramodern manufacturing base that sprawls over a wide area for creating perfect quality products. Under the guidelines of our mentor, Mr. Anand Bhosale, our organization has become a renowned name in the industry. We The Member Of M/S. Techsuppen Enterprises Are Committed For Total Customer'S Satisfaction By Giving Products At Competitive Price And On Time Delivery With Excellent Quality. We, Will, Achieve This By Continual Improvement In Our Quality Management System And Involvement Of Our Employees. We believe in building an enduring relationship with our valued clients by offering them the finest quality products and services at leading industry prices. We offer various and easy options of payment keeping in mind the convenience of our respected clients. The client-focused approach has enabled us in garnering a wide client base across the market.